I have saved the lids from frozen juice cans forever thinking they would be good for a project someday. Well, someday has come! 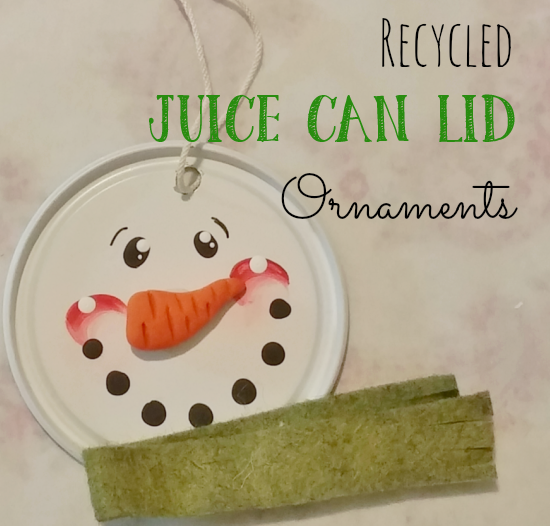 I made some simple little snowman ornaments with some of these lids. 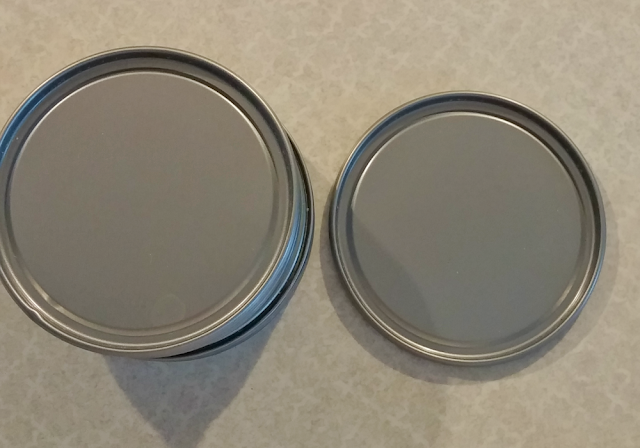 These are the lids I'm referring to, they are on the cans of frozen juice concentrate. 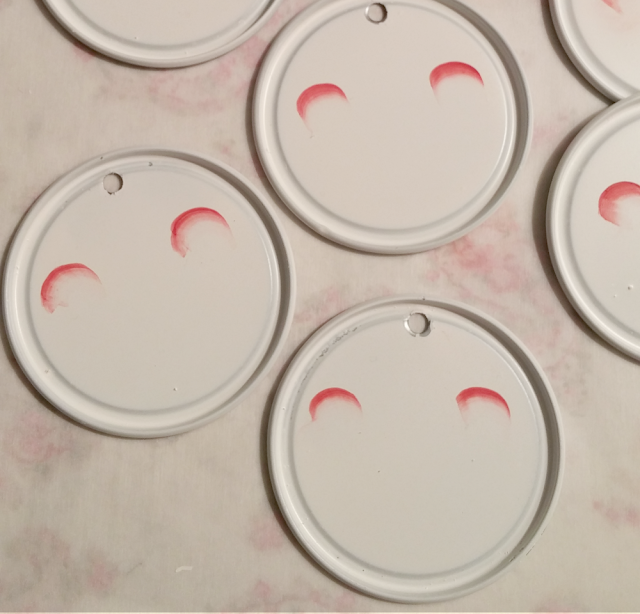 To begin, give them a coat of white spray paint. Punch a hole in what will be the top of the ornament. 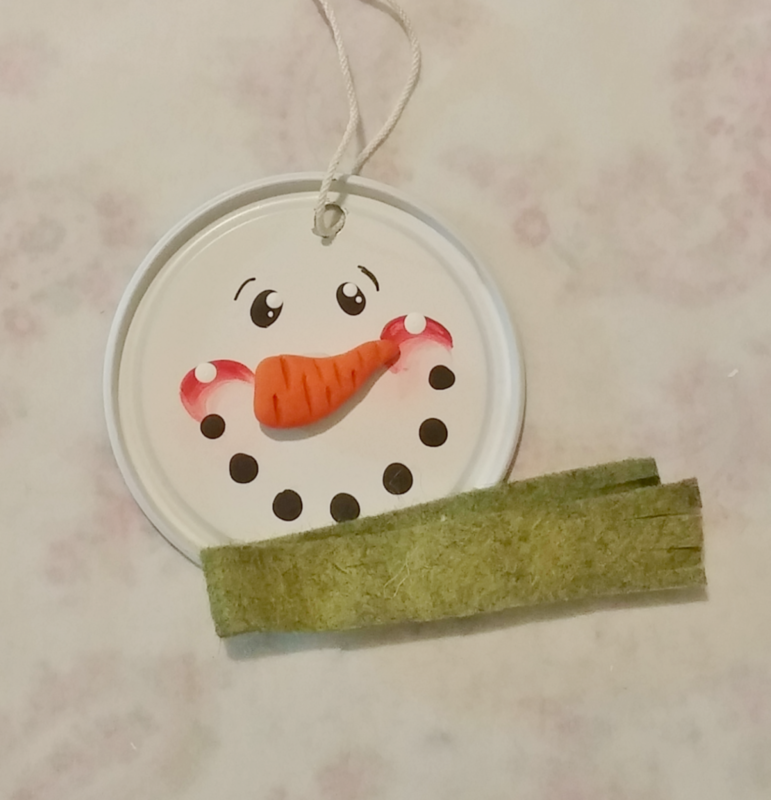 I use my Crop-a-Dile punch from We R Memory Keepers. This thing is awesome, it will punch through metal, paper, plastic, etc! Cover your work surface with a piece of parchment paper. 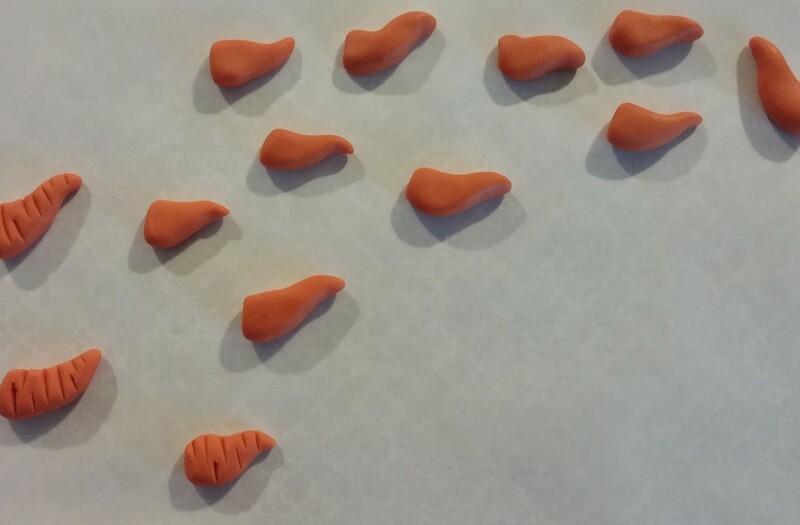 Roll a little ball of clay into a short rope, making it larger on one end and semi pointy at the other. Flatten one end by pressing it onto a hard surface. 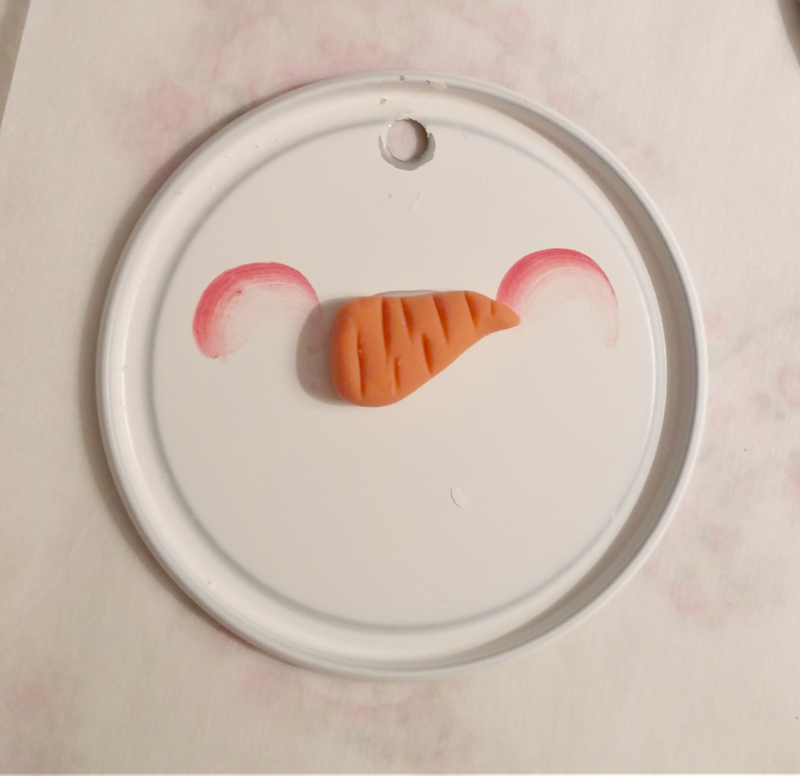 Lay the nose down sideways and press it gently so one side is flat against your work surface. You can shape it so it is crooked if you wish. 5. Make the lines (like a carrot would have) with a straight pin by pressing it gently into the clay. Make some lines longer than others and make some toward the top and some at the bottom edge. 6. Bake them following the directions on the package. Paint little rosy cheeks on the lids a little higher than the half-way point. 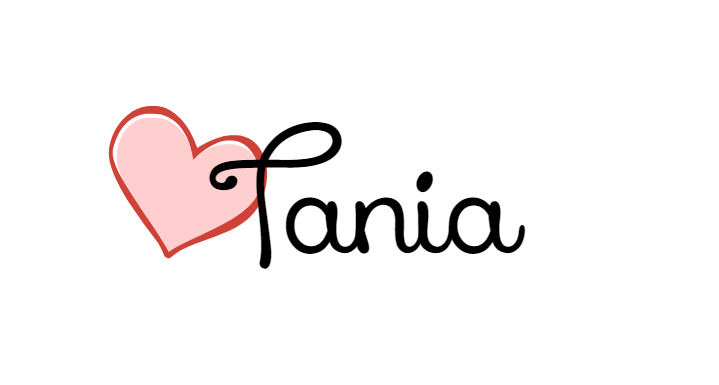 Use a flat artist brush like this one. Wet it, dab it on paper towels so it is still slightly damp but not dripping. Stroke half of the brush along the edge of a squirt of red or pink paint on your palette (I use a butter container lid for my palette) so that only half of the brush is loaded with paint. Make one stroke on your palette so it won't be too dark. 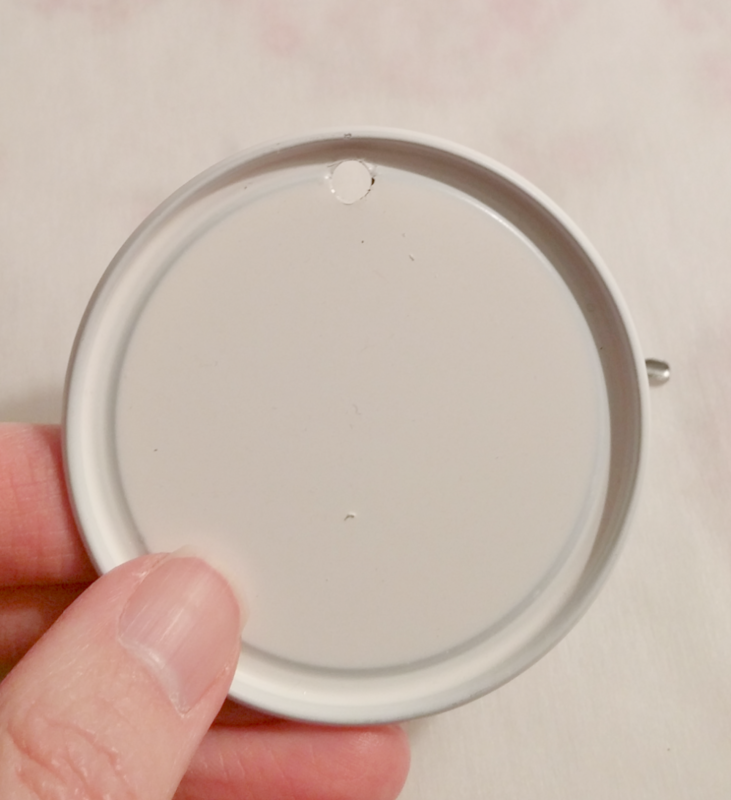 Make one curved stroke on the juice can lid. 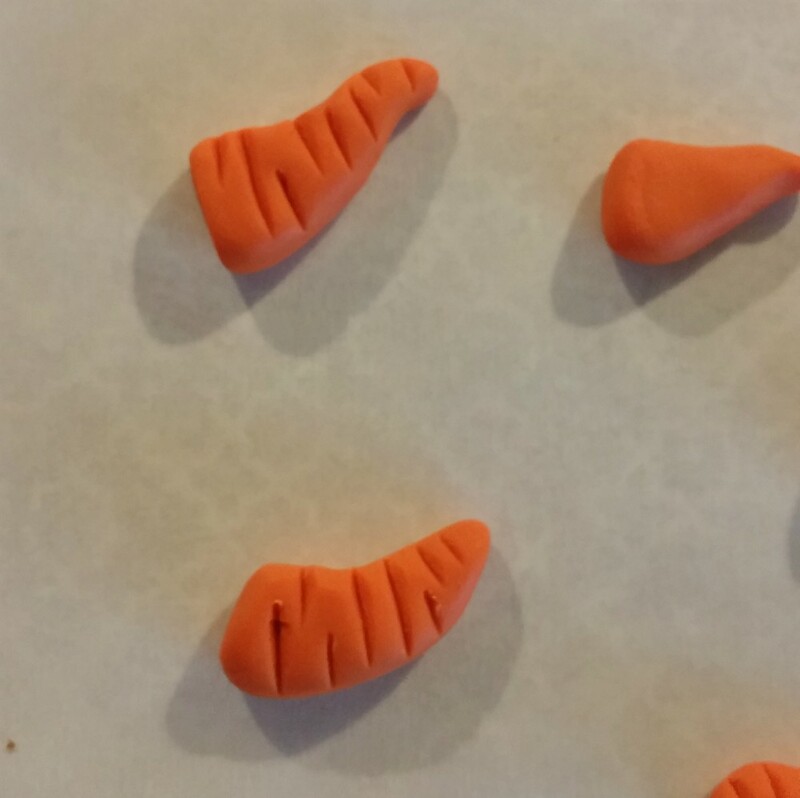 After you have your cheeks, then glue on a little carrot nose. Next, use the end of your paintbrush, dip it in black paint and then dab on some eyes. Then repeat this step to make the mouth. Repeat this step with a smaller paint brush and white paint to make the highlights on the cheeks and in the eyes. Cut a long strip of felt, fold it in half and glue it to the bottom edge of the lid for a scarf. 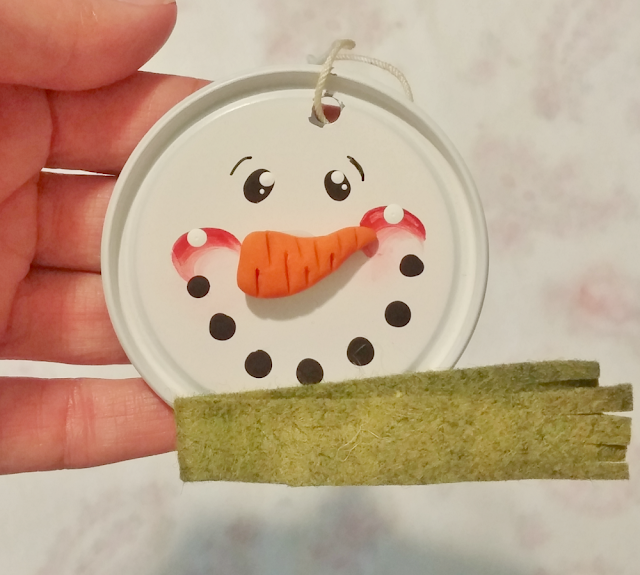 Add a string for hanging and you have adorable snowman ornaments! These would make great package tags too, you can write on the back with a Sharpie! 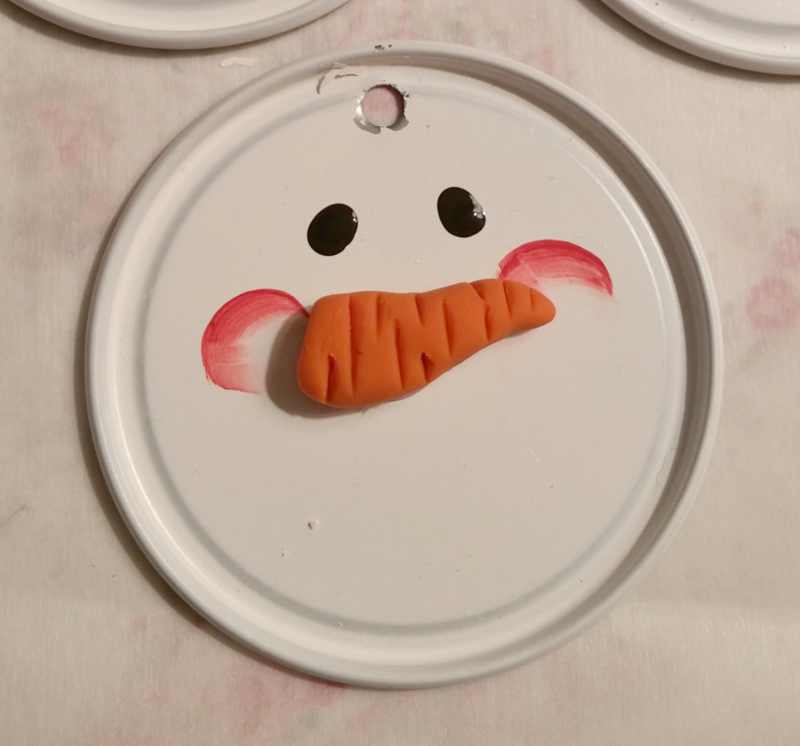 Adorable snowmen & great tutorial! 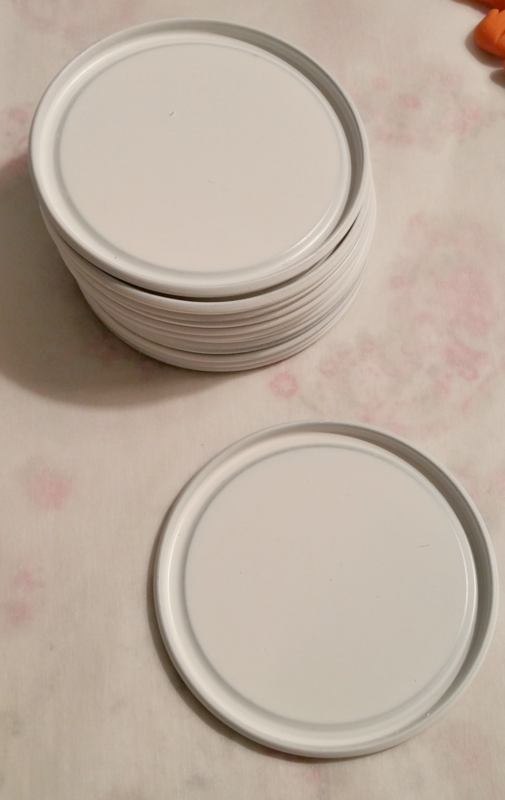 Yes, collect some lids and give it a shot!! You make this look so easy! Fun snowman craft! I need to collect those lids. These are adorable, Tania. 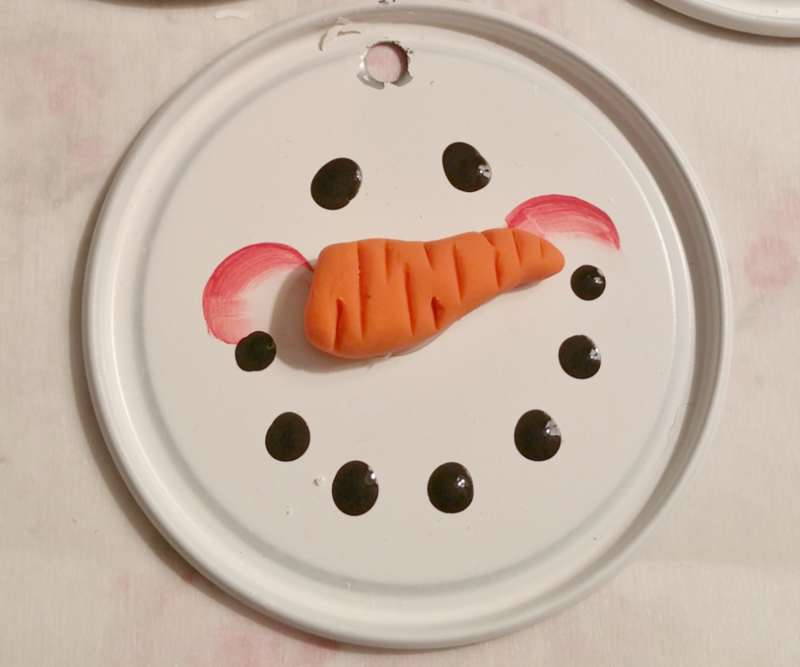 The carrots add a wonderful touch of whimsy. Happy Holidays! Thank you so much Amalia! Happy Holidays to you as well! Tania, these are super cute! Have a wonderful Christmas! Thank you, you have a Merry Christmas!